while most people flock to oxblood lip colors at the first sign of cold weather, i do not. the color, other than red of course, that i jump into at this time is more berry. 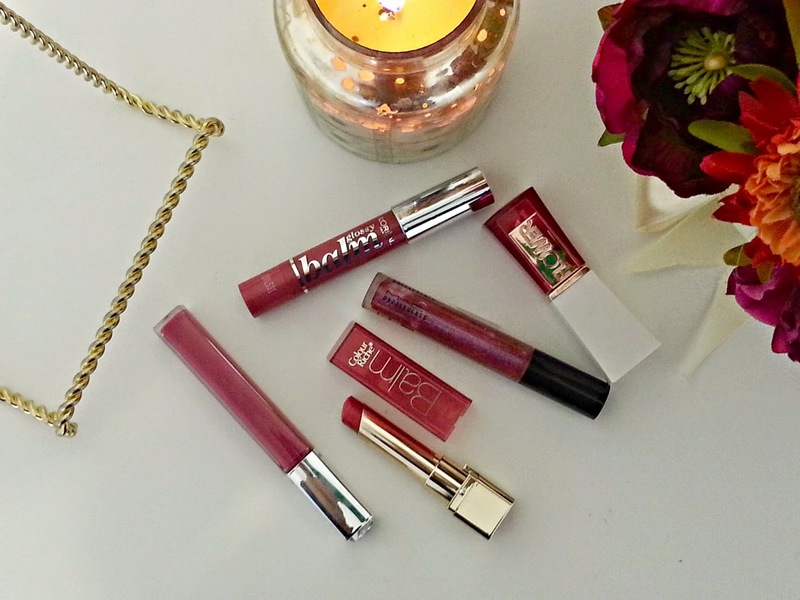 i rounded up 5 of my favorite berry shades that range from sheer to full on color. Revlon Ultra HD Lip Lacquer in Garnet- to be honest i was first drawn to this product because it has a giant rhinestone on the top. bedazzle anything and i want it. the color is very rich. it is more like a liquid lipstick than a gloss. it is not sticky and it lasts for a long time. i was very impressed by this product. L'Oreal Colour Riche Balm in Heavenly Berry- an oldie but a goody. it is sheer but not so completely sheer. it is my favorite berry shade ever. this is my everyday lip color during this time. this shade makes all neutral brown eye shadows pop. MAC Dazzleglass in Date Night- this shade leans towards the purple side with an iridescent sheen to it. plus it has bright purple glitter in it. it doesn't look cheap or childish though as it is very fine glitter. trust me, wear this and the shine of this gloss will get you noticed. L'Oreal Glossy Balm in Vintage Rose- this balm is so creamy and buttery. it goes on smooth with a good amount of color. not wild about the scent at all but i can over look that. Flower Lip Service Lip Butter in Wispy Wisteria- seeing a trend in my favoring lip balms than a full on lipstick? this product doesn't disappoint. it is slightly thicker than the rest but regardless still goes on smooth. the color is vibrant and buildable since it is not so sheer to make it look more like a lipstick. let me know what your favorite berry shade is in the comments below or tweet me @lifeinmascara.